How Much Should I Pay For Velux Windows? Anyone whose home has one too many dark corners understands the importance of lighting. A fantastic way to bring more light into your property is with a roof window. These allow the sunlight to flood into your home, transforming those dark and dingy areas, such as converted lofts and stairwells, into real wow factors. They can add a pretty penny to the value of your home too. Commonly called Velux windows, sky lights actually come in all manner of forms, and from many brands; Velux is just one of the more popular companies. There are a variety of styles and designs to suit the aesthetics of your home too. In addition, you’ll find various window features to choose from such as locking options and opening mechanisms. For example, some windows swivel on a central hinge in the middle, whilst others may open and close from one end. 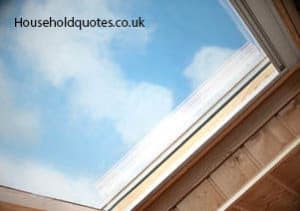 As you might expect, having a roof light fitted isn’t cheap, and you’ll need to set aside a large enough budget to cover the window itself and the labour required. When installing a skylight, roof timbers will need to be cut and you might need some extra supports. A small amount of plastering will also be required after the work’s completed to ensure a seamless integration of the new window with your home. Typically, a window of this size would be ideal for a bathroom area. The cost of installation, complete with flashing kit, collar, insulation, roof alterations and waste disposal is likely to be between £800 and £1,100, with prices a hundred pounds or so higher in London. These larger windows are commonly used above stairwells, loft conversions, and on single story extensions where light needs to be brought into living areas. Installation costs are likely to be between £1,300 and £1,600. If you’ve already got a skylight but need your Velux window repaired, costs are likely to be a little less. In fact, you might not even need to replace the entire unit, and a skilled contractor can easily install new flashing trim or glass. If, however, you do need a new window, costs are likely to be as follows. To remove, replace and dispose of all waste products, you should expect costs of between £600 and £900, with expenses a little higher in London. The cost to have a larger window replaced can be between £1,100 and £1,400. One of the largest variables in having Velux windows installed or replaced is the labour costs. The cost of Velux windows won’t differ from region to region, and the costs of removing a roof light and cutting a hole and timbers are minimal. For this reason, it’s a good idea to use a website like Rated People where you can look up local contractors and negotiate a good price. Unfortunately, there are a number of other factors you need to be aware of when having a window installed or replaced; all of which can bump up the price. Scaffolding, for example, can be quite expensive. It’s unlikely you’ll need to pay for this if you’re having a simple window installed, but if access is hard and scaffolding is required, particularly on the outside of a building, costs can quickly spiral. Vapour barriers will be required to prevent condensation on all new windows, and if you’re replacing a Velux light and this is absent, it will need to be installed. In addition, features like electric openers, security glass, opening rods and additional blinds or shutters will all push the overall cost up. Luckily, there are ways to save money too. For example, instead of buying Velux windows, you could opt for a cheaper alternative. You might also be able to repair your window instead of completely replacing it; a project that will cost a lot less. Adding a roof light to your home not only brightens your living space, but adds value to your property too. And, if you shop around for the most affordable products and keep labour costs down, getting these windows installed might not be as expensive as you think. Get FREE Velux Window Quotes Today! Get Your FREE Velux Window Quotes NOW!